Just in time for Valentine's Day, this Rainbow Magic Special Edition is full of heart and sparkle! This book is a U.S. exclusive, written and designed specifically for our market. This Valentine's Day isn't so sweet! Where's the love? Jack Frost and his goblins have stolen the magical objects that make Valentine's Day so special. Now sweethearts are sad, and friends and families are fighting! Even Rachel and Kirsty aren't getting along. 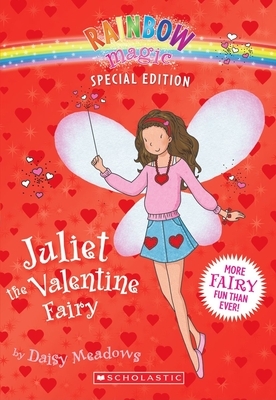 When Juliet the Valentine Fairy asks the girls for help, they can't say no. But can Rachel and Kirsty put aside their differences and bring the sparkle back to Valentine's Day? Find the magical treats in all three stories inside this Rainbow Magic Special Edition and help save the Valentine magic!